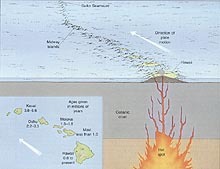 The best example of a hotspot producing a line of volcanic islands is the Hawaiian hot spot. Click image for larger view. Deep within the mantle, hot plumes of magma well up under the earths crust, forming volcanoes on continents and in the oceans. These mantle plumes, known as hot spots, are relatively stationary. They can produce lines of volcanoes, known as hot spot tracks, as the earths plates move over them. The most familiar hot spot track to scientists spans from the big island of Hawaii, which is currently over the hot spot, to the atolls of the northwestern Hawaiian islands. In the Atlantic, one of the longest hot spot tracks is the Great Meteor, or New England hot spot, located at 28ºW, 33ºN. It formed the New England seamount chain and the magma intrusions of the White Mountains. Two hundred million years ago (early Mesozoic age), just as the Atlantic was beginning to form, the area northwest of Hudson Bay was over the Great Meteor hot spot. Fifty million years later, as the Atlantic opened slightly, the hot spot track was under present-day Ontario. Sea mounts can be aged using naturally occurring isotopes of the element Argon. Click image for larger view. By 124 to 100 million years ago, the continental area of New Hampshire pushed over the hot spot, and the magma intrusions formed the White Mountains. 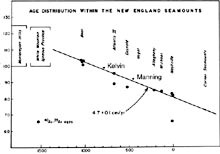 Finally, between 100 and 80 million years ago, the hot spot formed the New England seamount chain. Bear Seamountthe oldestformed about 100 to 103 million years ago. Moving southeasterly along the chain, the seamounts get progressively younger, with the Nashville Seamount being about 83 million years old. During the formation of the New England Seamount chain, the oceanic crust (itself only 120 to 80 million years old) pushes over the hot spot at a rate of about 4.7 cm per year. Finally, 80 million years ago, the mid-Atlantic Ridge migrated to the west over the plume. The track of this hot spot then continues on the African Plate and is found today at the Great Meteor Seamount. 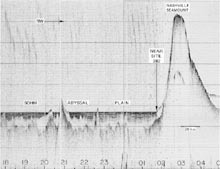 Before multibeam technology was invented, surveys of sea mounts were made by simple echo sounders. Click image for larger view. Most of the volcanoes of the New England Seamount chain reached to, or near the surface of, the ocean. Several sources suggest this. Near the summits of some of the seamounts, sediment and rocks of the age of nearby seamounts exist, suggesting that material produced during eruptions of later-forming seamounts landed on them. Other seamounts are flat-topped, a condition likely produced by erosion from surface waves. So why arent the seamounts near the surface of the ocean today? The best explanation involves how the earths crust forms and spreads in response to heating and cooling. As an area of the earths crust passes over a hot spot, or moves away from a spreading ridge, it cools and contracts. As it cools, the crust becomes denser, and sinks into the mantle.